Even top-quality furniture gets worn over time and may need to be refinished. 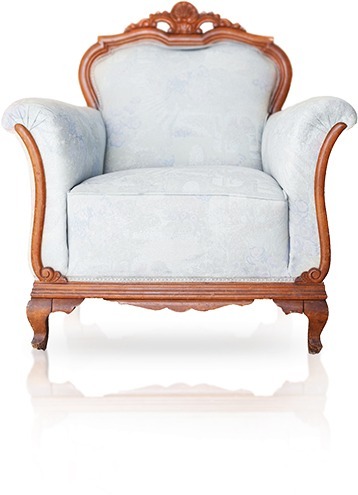 A quick refinishing project can make even the oldest furniture look almost like brand new. Some homeowners prefer to do this as a DIY project, but it can be difficult to do a good job because of the complexity and skill of most refinishing jobs. Keep in mind, however, when you hire a professional for furniture refinishing, the cost is generally much lower than the price to replace the furniture. Add to that, the furniture may be a family heirloom, thus making it priceless! Actual pricing will be adjusted for style details, required repairs, size, desired finish, etc. These are offers but an idea of what to expect. *All old fabric removed, loose joints re-glued, springs rebuilt, if needed. All new frame padding. New cushion inserts. Standard is premium high resiliency foam. Other fills available. Wrinkle free application of new fabric. Proper fit of cushions. Attention replicating original appearance. Extra padding on arms and top back for comfort and to promote less fabric wear. *Re-gluing of joints by cleaning off old glue using furniture grade 2-part epoxy injected; the epoxy does not dry out like glue. All joints to be carefully clamped to promote superior strength. Chair legs will be leveled as needed. *Pieces will be disassembled for a thorough restoration and loose joints repaired. “No Water” finish removal since water can/does damage joints and roughs up wood surface; destroys aged wood surface patina. Slow setting stains to be used for better color adjustment when necessary. Kitchen cabinet grade catalyzed lacquer sprayed on for durability.